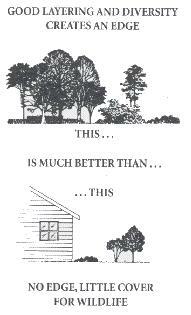 It is a challenge in today's society to create habitat in the form of cover in your back yard. There are external pressures that one deals with when making the decision to attract wildlife. I personally know the sociological mindset of many people who see cover as something "messy." They, with manicured lawns, proclaim themselves as upholding the standard set for urban beauty. Often, it is simply lack of education. By sharing your plan and ideas before proceeding with your project, your efforts may at least be accepted if not understood. If efforts to communicate and educate others fail, an alternative is to use a tall fence or screening hedge to prevent neighbors from having a bird's eye view of your project. Results speak for themselves and many times neighbors follow your lead after observing the beauty, seclusion, and time saved for other activities with implementation of a wildlife landscaping plan. The goal of cover is to protect wildlife from the elements of weather and predators by providing trees, shrubs, grasses and structures which offer year-round protection. Wildlife not only require protection from cold winds during winter, but also need areas to nest and escape predators. Providing cover close to a food source will decrease the chance of predation as wildlife move to feed. To choose your cover arrangement, determine which wildlife species can benefit or which species you would like to view on your property. A typical back yard is limited in size and will not be big enough to provide adequate nesting space for grassland birds such as the sharptail grouse, waterfowl species like the Canada goose, or enough isolation for raising a large mammal like the white-tailed deer. Many larger species, however, can be lured to your yard given larger habitats are found in the area. The key to providing cover for wildlife is to avoid uniformity. In other words, you want to create what biologists call "edge". Edge is defined as providing the largest variety of habitat components within a given area. For example, a yard filled with large trees, medium trees, shrubs, vines, grasses and wildflowers will attract a much more diverse number of wildlife species than will a yard covered entirely with a single component. General plans and concepts, to include best plants for wildlife and their arrangement, will be covered in more detail within the upcoming chapter entitled "Landscape Planning". make boundaries of plantings in irregular shapes instead of rows. plant shrubs in clusters or clumps. provide a tiered effect with vegetation stands. add other components such as brush piles, rocks and logs throughout the area. Wildlife will benefit and move about more freely if travel lanes are provided between plots of cover. Typical urban backyards can be landscaped with trees and shrubs to provide areas for songbirds to nest including species like chipping sparrows, robins, orioles, vireos, finches, bluejays and small mammals like cottontail rabbits, tree squirrels, ground squirrels and weasels. All of these species will respond positively to a yard planted with a variety of cover types. Cover is most often thought of as vegetation but can also include structures like brush and rock piles or man-made nesting structures like those built for wood ducks or bluebirds. Brush piles can provide more edge and are a simple way to provide cover for wildlife such as cottontail rabbits, weasels, and reptiles and amphibians in a situation where cover is limited. Brush piles are constructed with trees branches and twigs which have been pruned or cut from an area where they are undesirable. Brush piles should be the product of another practice you are already doing. In other words, simply cutting existing vegetation to make a brush pile could be taking better natural cover from wildlife than what you are creating in the brush pile itself Also, predators such as skunks and weasels may utilize brush piles and it is advisable not to put brush piles in close proximity to wetlands where young waterfowl and shorebirds may become food. After deciding whether a brush pile is beneficial for your location, choose a location adjacent to existing shrubs, trees or along the edge of a field. Begin with a foundation of large tree trunks or rocks to prevent brush from decomposing too quickly. By adding hollow logs, bricks or old sections of culvert near ground level, cover and nesting space will be greatly increased. Continue piling cuttings until you have a dome about five feet high and fifteen feet in diameter. Finish by topping with a couple of heavier trees to prevent brush from moving or blowing around. 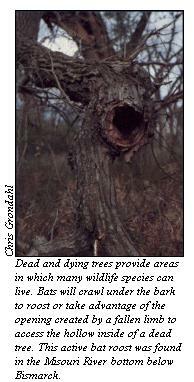 Dead and dying trees are known to biologists as snags. At first glance, most people see a snag as an eyesore or a good piece of wood to burn or add to the landfill. To wildlife, snags are a source of food in the form of the many insect species attracted underneath bark, and a home in the form of a nesting cavity. 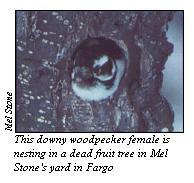 There are many species of wildlife that use dead and dying trees (snags) to build their nests. These include bluebirds, wood ducks, tree squirrels, bats, yellow-shafted flickers, downy woodpeckers and house wrens. One of the easiest ways to provide cover for wildlife species in early years of landscaping is to provide nesting structures because natural cover will be limited. 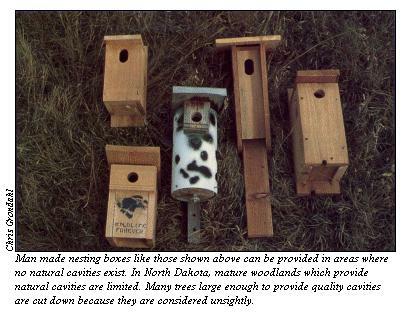 Structure, which will generally show immediate results, are nest boxes for cavity nesting species. 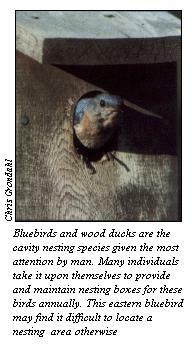 Cavity nesting species require a cavity in which to build their nest and lay eggs. These man-made structures mimic the natural cavities found in dead and dying trees and can be provided for wildlife in almost habitats. Wildlife differ in need depending on their size and habits and nest boxes need to be designed with those needs in mind. kredikartiborcvelimitsorgulama made a real revolution in the industry.